When Italian born Production Designer Ferdinando Scarfiotti died in 1994 he left a relatively small but incredibly influential legacy that includes some of the most visually astonishing films ever made. The Oscar winning Scarfiotti was born in 1941 in Marchesa and exploded onto the cinematic scene with his incredible work on Bertolucci's THE CONFORMIST (1970). Outside of how truly original and striking his work was on THE CONFORMIST, perhaps the most incredible aspect of it was that Scarfiotti was relatively inexperienced at the time. Bertolucci was suitably impressed with the young theatre based Scarfiotti and he quickly signed him up for his follow up film, LAST TANGO IN PARIS (1972). Scarfiotti's work on these two films is simply beyond compare and they remain two of the most iconic and thoughtfully designed films in cinema history. Scarfiotti's major talent, outside of his obvious technical skills, seemed to be in understanding the exact thematic feel of the film's, and characters, he was assigned. THE CONFORMIST. LAST TANGO IN PARIS, DAISY MILLER (1974) and SCARFACE (1983) would be unthinkable without Scarfiotti's design schemes. It was this thematic intelligence that makes his work on Paul Schrader's AMERICAN GIGOLO (1980) and CAT PEOPLE (1982) so intriguing and individual. While his collaboration with Bertolucci is his most acclaimed, I believe his work with Schrader is perhaps just as important. The design in AMERICAN GIGOLO kick started the entire slick, commercial and ultimately corrupt look that so many filmmakers would copy throughout the eighties. Many of the eighties best (Michael Mann, Luc Besson) and many of it's worst (insert your selection here) would come directly out of the collaboration between Scarfiotti and Schrader in GIGOLO. CAT PEOPLE might not have been as brilliant as his work with Bertolucci or as influential as GIGOLO, but his total understanding of CAT PEOPLE'S themes of sexual suppression and Irena's internal struggle mark the film as one of his most intelligent and bracing works. 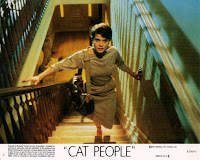 Everything in CAT PEOPLE, from the odd dream and flashback sequences to the startling and at times suffocating interiors, has Scarfiotti's mark all over them. As the film progresses and Irena becomes more and more confused and anguished so does his design work. Perhaps the most telling scene in the film is the moment after the night hunt when all Irena can do is literally destroy the light that is showing what she is capable of. As I noted before, Schrader initially want the film to be co-credited but the director's guild refused. For a much more detailed and knowing look at the importance of Scarfiotti give a listen to Schrader's commentary or seek out the vintage America Cinematography issue dedicated to CAT PEOPLE. After CAT PEOPLE Scarfiotti would design just a hand full of films including Sting's great BRING ON THE NIGHT (1985) and two more works for Bertolucci. He would win the Oscar for THE LAST EMPEROR in 1987 and tragically pass away in 1994. Much more than just a Production Designer, Scarfiotti would involve himself in multiple aspects of each film ranging from minute details in costuming, lighting and most importantly motivations of not only the filmmaker but also performers. 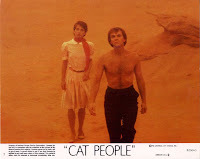 CAT PEOPLE is one of the most visually arresting films Nastassja Kinski ever got to appear in and that can be, in no small part, partially credited to the brilliantly original Ferdinando Scarfiotti. More of these beautiful lobby cards can be found at the fantastic Nastassja Kinski JP and as my vacation is one day from wrapping up, regular postings will pick up again in the next couple of days. Thanks for your patience and continuing support.